Yes you see them everywhere. They are your friends, family, neighbors, employers,politicians. You can see it at some concerts. You can see it in shopping centers and yes it runs rampant on the internet. Sheeple mentality starts at a very young age. It starts as soon as our parents start telling us what to thing rather than to start thinking. It is re – enforced at school by teachers who for the most part are sheeples themselves. This isn’t a new phenomenon, there have been sheeple among us for thousands of years. Urban Definition: People unable to think for themselves. Followers. Lemmings. Those with no cognitive ablilities of their own. 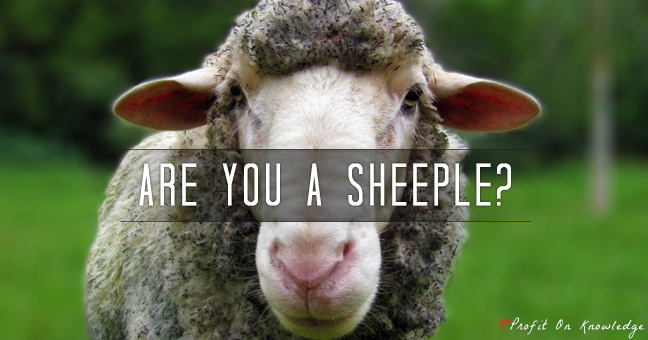 Are You One Of Those Sheeple? It’s okay to be a student. What isn’t okay is to blindly follow advice without thinking it through yourself. Some folks are so insecure that they constantly second guess every action they take. Than there are some folks out there who simple don’t want to think because it hurts their head. Unfortunately people with sheeple mentality are the same type of people who watched innocent people rounded up and killed during World War Two and other wars. These same people are the type of people that when they see someone getting hurt they turn a blind eye to it and go about there business. It is also these types of people that line up in droves wanting to start an online business. Remember back to your school days. Do you remember some of those clicks? You know the ones I am talking about where it was cool to be with the cool people. Personally I wouldn’t know I never fit in the “cool crowd” I was always an outsider. I do remember them all wearing the same type of clothes, watching the same stuff and mimicking each others actions. By the time we are adults the seeds of sheepleness is deeply implanted in us. Sheeple are destined for mediocracy. They will live there lives satisfying there own needs turning blind eyes to everything else around them and justifying their actions in the process. Governments love sheeple because they make it easy to control them. The only type of person who excels in business is a leader. Being a good leader requires you to be assertive. You need make powerful decisions everyday. You must accept all responsibility for your actions. Leaders know that the buck stops with them. All through history you read about amazing people. For all intent and purposes none of those people where sheeple. All the positive self talk in the world won’t help you if you are part of the sheeple conspiracy. Don’t worry though there is a way to break away from the herd. What is even more exciting is it’s actually easier than you think it is. To put it in simplest terms. Stop listening to everyone and following everyone and start listening to your inner wisdom as my friend likes to say. It’s okay to take good advice, it’s okay to listen to your coach, mentor, teacher, sifu, friend etc.. What isn’t okay is to do what they say blindly. Don’t be one of those people who wait till someone tells them what to do. Be daring, take risk and don’t be afraid to make mistakes. i think you spelled a word wrong here: “as soon as our parents start telling us what to thing rather than to start thinking” –> “what to thing” ?? haha, it’s no big deal though just saying. i know Sheeples can destroy a country, by blindly following and electing the wrong people and governments, but business speaking. Sheeples are so predictable and simple, and when you can predict things it’s easier to make money out of it. everybody is conditioned to buy useless reddish stuff on valentine, cool, the Sheeples behavior is predictable and we can work on that. Yes i do agree with you that people are turning into sheeple, Most of my friends are following their role models or actors blindly, They even dont know that no two people have same life, Different people have different mentality,weak points,strong points and emotions, we should find our own path rather than following others already discovered path. Hi Chris, that is exactly right. We should follow our own path and not others. Although there is something to be said for modeling successful people in your life. You have a really excellent point about sheeple making poor business owners. Sheeple don’t make decisions and business owners definitely have to make important decisions every day. I love my business but sometimes it gets scary being the one in charge all the time! Thanks for reminding me of why I choose not to be a sheeple! I am very much in agreement on your general concept on the topicality “the Sheeple”. Perhaps missing a change; as you say what is even more exciting is it’s actually easier than you think it is. Hey Larry, the cool thing about the sheeple effect: they are wonderful customers! ok, no joke. it’s a problem, also because the best customers are the ones that really follow their desires and needs, so marketing can give the right product at the right moment. It’s a good balance. Sheeps are the worst. As customers they also believe to think more than you and that your decisions as expert are useless, and this happens when you are right 99.9!!! The world needs sheeple. I am just suggesting if you want to be a self – employed person you can’t follow that trend. You need to think outside the box and present yourself in a unique kind of way. You bring up such a good point. Sheeple are only easy to sell to if they think something is “cool”. Since sheeple can’t think for themselves they don’t want to be un-cool. Thanks for stopping by and commenting. Your right about that. The downside is though, due to the cool factor many people end up not totally being informed about their buying decision. I am not a sheeple. In fact, I believe I am very enlightened, and because I “think outside the box”, the sheeple shun me. Hi John, it’s good to hear. The one main disadvantage discussed above is that sheeple cannot become good business owners. Frankly speaking it is true ,as they lack of leadership qualities . Being good business man requires to be assertive, take up decisions and responsibilities. It is okay to be advised by friends, elders , or others but doing that blindly without thinking is a big mistake and if we can change that habit we surely can change our sheeple nature . Good post and i hope this post will help many people especially the people who are sheeple in nature. What will happen? All of hte liberal progressive nay Sayers will be running around blindly wondering what happened. Me, I will be sitting at home protecting what is mine.